“I believe you are previewing Silence today,” said the email. I blinked. I had only just opened my laptop on a Tuesday afternoon in order to prepare my notes for my film class at Northwest University. But everything else vanished in a moment. All I could do was study the email in front of me to see if it was legitimate. I had not, as a matter of fact, heard anything about a preview screening of Silence. If I had, believe me, I would have been out the door and on my way, hours early if necessary. Martin Scorsese’s big-screen adaptation of Shusako Endo’s novel Silence has been at the top of my most-anticipated movies list for more than a decade, since it was first reported that he was excited about the idea. But I had, until this moment, been unable to find access to a sneak preview, even though the film had already screened for some reviewers and was already open in New York and L.A.
Talking to a friend with studio “connections,” I learned of troubling rumors that Paramount might be discouraging reviewers from seeing the movie for fear of a backlash similar to what they received when Scorsese directed his adaptation of Nikos Kazantzakis’s The Last Temptation of Christ. I can’t verify or deny those rumors — I’ll just say that the possibility doesn’t sound unlikely, considering what I have experienced firsthand at the receiving end of “evangelical wrath” over movies that make them uncomfortable. And so I had given up. I figured I would see the film along with other Seattle moviegoers when it finally opened. But this message — where had it come from? Why did it come to me? I’m still a little mystified. Grateful, but mystified. The sender — a publicist who proved quite generous and helpful — had been misinformed. He believed I had been contacted about, and that I had accepted the invitation to, a screening happening that very night (a week and a half before the actual Seattle opening date). Not only that, but he also informed me that if I did attend, I could then interview Martin Scorsese himself the following weekend. I tried to maintain my composure and, dear reader, I accepted the invitation. Scrapped my Tuesday night plans, I called up a friend. (Shouldn’t everyone go see Silence with a poet named Christian?) And we soon found ourselves sitting in a downtown cinema, next to Gregory Wolfe — the publisher of the literary journal Image, and the lecturer who had led me and my fellow Seattle Pacific University graduate students through a week of discussions focused on Endo’s novel. 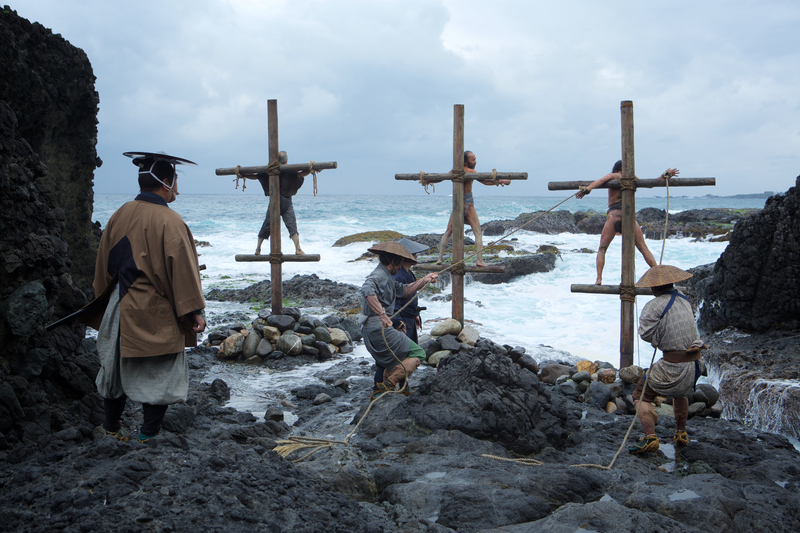 A scene from SILENCE by Paramount Pictures, SharpSword Films, and AI Films. At last, I saw the film that I’d waited so many years to see — and I was relieved to find it about as faithful as any book-to-screen production I’ve experienced. And then I got to work, barely believing I would have a chance to speak with the artist responsible for so many of the most influential films in my moviegoing experience — personal favorites and features that changed the way I think about cinema, like Taxi Driver, Raging Bull, The Age of Innocence, The Last Temptation of Christ, and The Wolf of Wall Street. I’ve interviewed many fiercely intelligent filmmakers — Michel Gondry, Danny Boyle, Spike Jonze, Charlie Kaufman, Alejandro González Iñárritu, and Alfonso Cuarón, to name a few — but I knew that this was going to require even more preparation. Why? Well, have you ever listened to Martin Scorsese? He has so much energy, he could easily fill an hour with substantial responses to a journalist’s opening question. How could I boil down my countless questions to a few that would make the best use of our time? As I expected, my plans went out the window once the conversation got going. I only asked a few questions, and they required some jarring changes of direction mid-interview. But Scorsese was as bright, as quick, as funny, and as thoughtful as we’ve come to expect from decades of interviews. What I didn’t anticipate was just how open and personal he would be with his answers. Some of those answers were included in an article I was already writing: a Silence-focused installment of “Viewer Discussion Advised,” my weekly column at Christianity Today. You’ll find some of my reflections on the film there, but that column isn’t designed for interviews, so I had to leave out much of what Scorsese shared. Here is a fuller representation of our conversation. 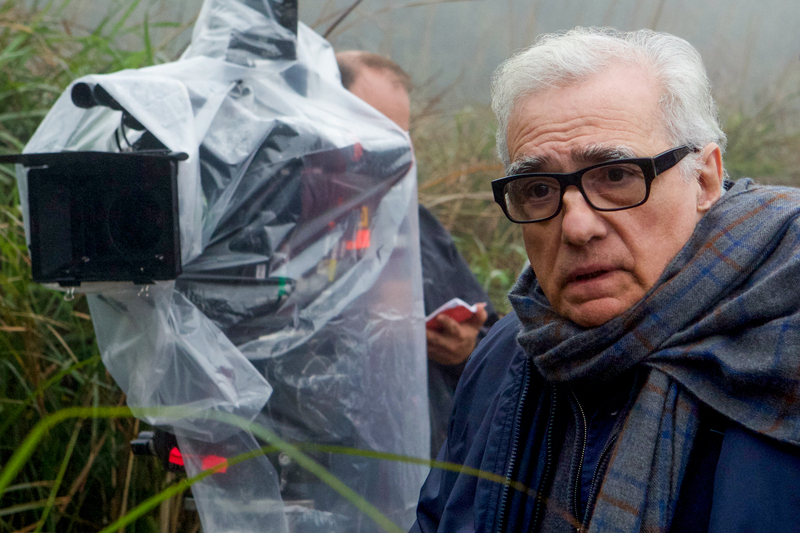 Keep in mind, Scorsese speaks very quickly, and often makes sharp turns mid-sentence. So I have edited as carefully as possible to be faithful to a very spontaneous and lively exchange. Disclaimer: My questions here have been paraphrased. His answers have been respectfully abridged. And I share this with tremendous gratitude to the generous publicist who reached out to me, so unexpectedly, with this opportunity. I will never forget it. Watching Silence, I was reminded again of something that struck me about ten years ago, when I first read Endo’s novel: As the two priests — Rodrigues and Garupe — rely on an entirely untrustworthy native for guidance in hostile territory, they’re like Frodo and Sam in The Lord of the Rings, placing their lives in the muddy hands of Gollum. And once again, we have a story that appeals to our capacity for mercy for a traitor, a fool, and a wretch. I began thinking about how many of your films focus on stories of sympathetic wretches. Yes! That says it all, really. Why is that such a compelling, recurring theme in your work? It’s something I grew up around. I grew up in the 1950s in the lower east side of New York , an area where they were hard-working people, but there was also an element of the underworld, the crime world. There was the church, which mitigated that to a certain extent. And there were the ‘wretches’ — unfortunately, you could call them that — and the drunks and the alcoholics who were dying on the bowery. I was repulsed by it. But [I felt] a pity at the same time, and a compassion for these guys. It was really hard to put the two together — your parents saying “Don’t touch them” (and they were frightening), and [yet]… this ‘wretch,’ it was the abject destruction of a human being, right there. I could see it. And then there were the crime figures — on the small scale, and sometimes on the bigger scale. The violence itself — from time to time yes, I saw it. But their thinking — that kind of thinking which is almost primitive, dark Ages, medieval, tribal — that is what was disturbing there. So, for me, the only place that had a sense of reason to it, or a kind of moral code that was not an underworld crime code, was my family. [I learned] that code from my father, my mother, my brother and I, in our little apartment. And then there were aunts and uncles: My father was one of eight or nine, and my mother was the same. It was how they behaved with the family. And there were the priests around the corner at St. Patrick’s Old Cathedral — the younger priests, not the older priests. The older priests were mainly stationed there for the older Italian immigrants, who were then, by the ‘60s, dying off — and many of them spoke Italian only. 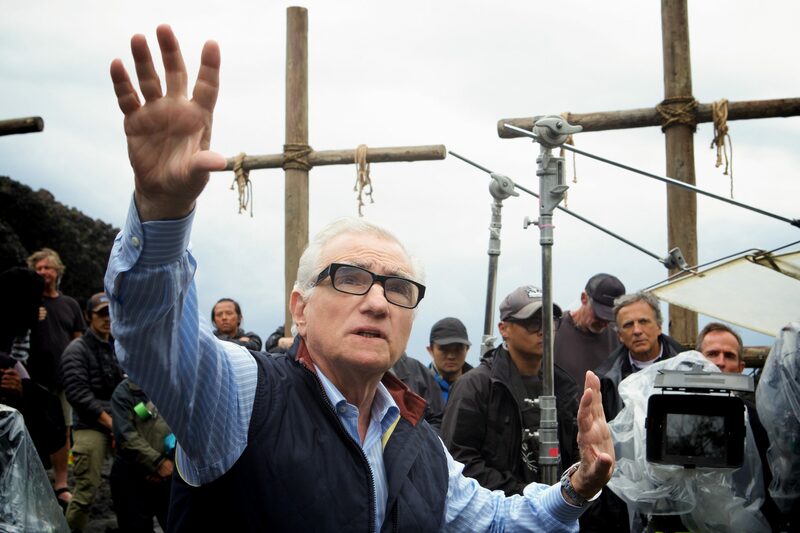 Director Martin Scorsese on the set of SILENCE. But there was one young priest [Francis Principe] who was stationed there in 1953. I was eleven years old. He was there six years, through the formation of my adolescence. He was a great guy and mentor, and he told us “You don’t have to live like this. This is America. Read.” He gave us Graham Greene, Dwight Macdonald, and many other authors. He had us listen to classical music and all sorts of things. He had very strong opinions. And he was pretty tough. He guided us all the way through. My father liked him. But I saw the priest could talk one way, and deal with morals and ethics in the outside world, but within the family, it was a little different. My parents weren’t educated. My father worked in the garment district. There was no hope of, as they used to say, ‘bettering themselves.’ … His youngest brother was always getting trouble, and my father was the one who had to deal with that. I was half-raised by this person, too. He was married, had two kids, in and out of jail, owed a lot of money. There was a lot of violence involved. Basically, my father was the one who would constantly be dealing with him, negotiating and pleading for him, paying the bail and taking care of things. And so the issue of ‘my brother’s keeper’ comes to mind — knowing full well that once my father took care of this latest problem, it was only going to happen again at another level. I watched this my whole life. My mother argued against it. My brother did too. But my father took it up. He took care of him. And this other fellow was not a likable man. These were tough people. [He laughs.] It’s not a bookish culture. I saw that acted out in very dramatic terms. It was crazy. It was kind of dangerous at times. I wondered how this bond could be there. That was something I saw acted out as ‘Christian.’ My father didn’t go to church very much; neither did my mother. But they lived it out. I saw them live what they thought was a moral life. In talking about this film elsewhere, you mentioned that the Japanese are afraid of four things: lightning, earthquakes, fire… and fathers. And that has significant implications for how we read — or watch — Silence. The missionaries are trying to impart a message that has been shaped by a patriarchal culture. But the voice of Jesus is characterized, at the heart of Rodrigues’s Japanese experience, as a tender, gentle, and — dare I say maternal voice? This comes from what I read about Endo. I’ve read everything of Endo’s. Once again, his Life of Jesus — it was enlightening for me. He spells it out in his writings, that the Japanese do not need the authoritative aspects, the ‘fear’ aspects of Christianity, the paternal. They need the matriarch. They need the maternal. The nurturing, loving mother. This is another way. Earlier, before, when you mentioned ‘matriarchy,’ and you said… ‘Excuse the word’ or something like that. We shouldn’t have to ‘excuse the word.’ In a patriarchal society, if you admit, as a man, to any aspect of yourself as feminine… that is [perceived as] negative. Well, too bad! The reality is … that’s what the nurturing is: the mother. So many Japanese films are called Mother. So many great directors have made versions of Mother. [Director Mikio] Naruse made two versions of the same story — awesome! Just look at those films and you’ll see the extraordinary dedication and connection with the Japanese and their mothers. This is what Endo was pointing out — that that was the way to possibly begin to address the Japanese culture. 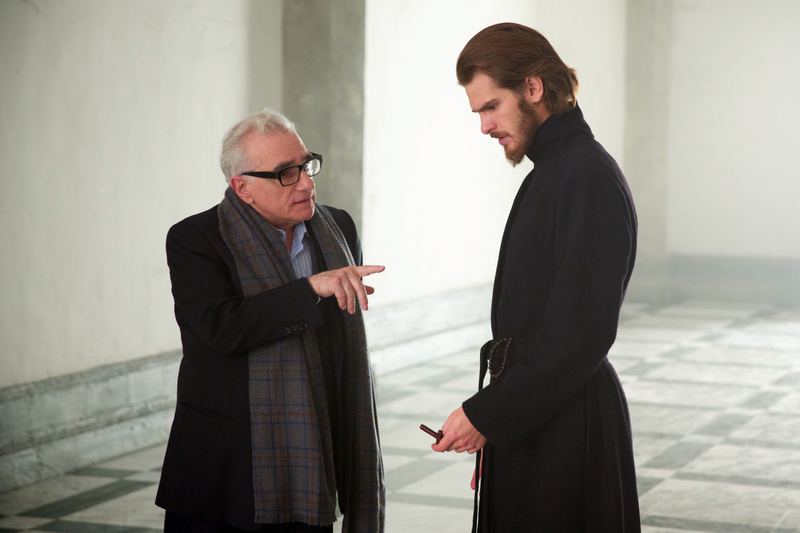 Director Martin Scorsese and Andrew Garfield on the set of SILENCE. And this gets to what the author Gregory Wolfe describes as ‘the ultimately tragic nature of evangelism’ — that something is always lost in the act of conveying one’s understanding of the Gospel to someone in another culture. As these Jesuit missionaries learn, what they think they’re giving to a foreign culture isn’t necessarily what that culture is receiving. I did think, ultimately, about the missionary. It seems to me — what do you impart? What does the missionary impart? Dogma? Maybe. From the outside, I’m looking in. And I think it comes down to action, to the behavior of the missionary, to being someone others would want to emulate. The Gospel comes with that. You live it out. I think because of the translation issues of the gospel, and because so many of the ideas are so foreign, whether in Japan or Iceland, one has to be someone that others can emulate. In the Gospel translations, going way back to the Greek, there are still mistranslations. There are so many changes. So the ultimate thing is the compassion and how is that expressed. That’s one of the reasons I wanted to make this picture! I must say. The more ‘material’ the world becomes — and it’s always been that way but in my 70-some-odd years, it seems more so now — the more material [the world becomes], the more we should be rethinking the spiritual nature of our human condition. It’s simple. Over the years, I’ve talked to so many people from their 90s down to a 10-year-old boy who say ‘Frankly, I’m an atheist, we don’t agree on any religious issues at all.’ Then add to that the extraordinary impact of technology. I see so many young people living on their iPhones. What do you do when you take the iPhone away? How do they fill their spirit? And isn’t that what happens, even to the missionaries? All that they have — even their religious vocabulary, even their traditions — are stripped away. It’s like that verse in John’s Gospel says: “Unless a seed falls into the earth and dies, it remains a seed.” They have to die to themselves, and all that is familiar to them, for the Gospel to be truly planted. I couldn’t help but think of that verse as I listened to Ferreira and watched what being a missionary had cost him. It’s also the epigraph, you know, of The Brothers Karamazov, which has a lot of interesting correlatIons with Silence. I just finished re-reading Karamazov! It’s like the Mount Everest of literary adaptation challenges, isn’t it? Well, there’s nobody I’d rather see take that on than you, at this point. So I can’t help but note the irony: When I reviewed The Wolf of Wall Street, I received an avalanche of angry mail from evangelicals who said that the movie was intolerably crass, and that its main character was unbearably profane. Belfort is greedy, he’s a womanizer, he’s cruel, he’s materialistic, and he’s a compulsive liar. They rejected my claim that I found your study of Belfort’s evils as meaningful. But then, when a presidential candidate came along who behaves just like Belfort — or worse — on an almost daily basis, and in public, well… many of them supported him because he offered them power. It has taken us back… to such a level that — well, I’m in my 70s, and I’ve never experienced anything like it. The Wolf of Wall Street is, basically, our government at this point. When I watched Silence, it seemed to me that you had taken a step farther than you had before. In past films, you alluded to matters of faith as if you were writing about it from a great distance, looking back on it as something you had left behind, or looking ‘across the water,’ so to speak, at something you appreciated but couldn’t embrace. This film, by contrast, feels like a homecoming, or a re-claiming of something essential. Is that a misinterpretation? What happened is that [making Silence] ultimately made me deal with faith even more. How should I put it? I found out that there are certain levels you reach, or certain goals you achieve, and then… what’s beyond that? What the heck is beyond that? And even if you get something beyond that, it still doesn’t fill the void. Part of that is filmmaking itself: It’s an obsessive impulse. You have to keep making pictures that move, and stories, and things that are not on the same level as the other pictures. But what can I say? I just have to do it. I enjoy it. I complain a lot about it, but I enjoy it. And I love the people. I love the actors. I come from the streets, and I love the hustlers — the ones who say one thing, and they have their hands in your pocket while they say it, and they’re taking whatever money you have. [He laughs.] I admire the audacity. It’s just … the world in a microcosm, in a way. And there are some really decent people who have been extraordinary to me in the past 40 years here in Hollywood. 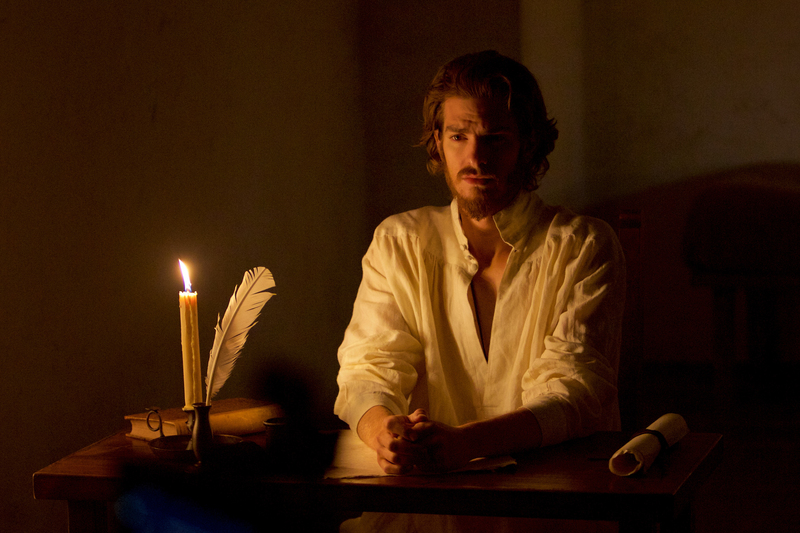 Andrew Garfield as Father Sebastião Rodrigues in SILENCE. I had it in Mean Streets, and everybody knew it. Taxi Driver, there was no doubt. And Paul Schrader who wrote it was a Calvinist. With Raging Bull — totally — we were involved with the spiritual side of the character, De Niro and I. De Niro is not necessarily overtly religious. But we didn’t have to speak — we knew it was us in the character of Jake. And we knew who we were at that time. That was a life-changing experience. And then it started all over again. I was trying to find other things. And that led to The Last Temptation of Christ. And that led to Kundun. Touchstone Pictures put that up there on the screen. What I’m saying is this: It only strengthened my resolve to explore faith more. So, maybe I have [faith]. Maybe, after all this time of being ‘in the disaspora’ so to speak (which I am), the real faith comes through by (as I was saying earlier) dealing with the people closest to you. Married again, and having a child late in life (the kid is now 17), [my] values change. (I have two older daughters — not that they were not valuable, but I was a different person then. I was younger. I had more energy.) … The bottom line is how you are with the people closest to you, and the people you work with, the people you love in life. Maybe that’s the best you can do. But the more hostility there is toward faith, the more I think we should look at it closer.